Home - Alisaxni resort in Akrotiri, Santorini, Greece. Alisaxni Resort is located in Faros(Lighthouse) in Akrotiri Santorini..
Around the Resort area you can find taverns and mini market where easily can be reached on foot..
All the rooms and Villas in our Hotel have an excellent view to the famous Caldera and are fully equipped with traditional furniture. The apartments can easily accommodate a family or a company of four people. Among the hotels in Akrotiri Santorini “Alisaxni” is one of the best options for your summer holiday in Greece for you and your Family. The Resort occupies a panoramique spot on the cliff of the famous caldera, obtains a Cycladic style architecture and is ideal for relaxation, away from the crowded areas, at the beautiful traditional area of Faros (Lighthouse) in Akrotiri area. Alisaxni Resort is a family owned business which aims to offer Greek hospitality, comfort and promise you a pleasant and unforgettable stay in the island of Santorini. The Resort has two main buildings that offer 5 studios, 2 apartments with Caldera side view and all these are surrounded from cultivation of local vegetables, fruits, vineyards and a nice pool with spacious Jacuzzi for 6 people overlooking the Aegean. Guests can choose to seize their day by swimming at the pool, sunbathing under the Greek sun, read a book under the shade or grill a fresh fish at the Barbeque area and enjoy a glass of local Asyrtiko unique wine. The hotel offers you 5 bedrooms and 2 flats. All the rooms have an excellent view to the famous Caldera. The surrounding area offers you the basic needs such as taverns with fresh fish and meat and a mini market. Akrotiri is a picturesque village that offers very important sites such as the Prehistoric archaeological site of 4500 BC, the famous Red beach, the traditional Medieval village of Akrotiri has to show the old Casteli which has been lately restored. Alisaxni resort has to offer various facilities and services to its guests. Breakfast in basket (we bring you the breakfast in picnic basket and you can enjoy it in the garden and pool area or in you balcony). Free of charge private parking place inside the Alisaxni Resort. Free of charge wireless internet access in all the rooms and to all open places inside the resort. Pool and Jacuzzi (6 places) located in the garden. Hiring a Vehicle to explore the Greek Islands is a popular thing for the visitors. Renting a Quad Bike – ATV or Scooter in Santorini is a good idea if like the total Freedom to Get around. Exploring the island with a Car that you can Rent in a Good Price is one of the first things that you have to do if you like to have a Comfort transportation on the island of Santorini! All you need is a driving license for Scooter, Atv. or a Car and in many cases you will need International driving license. It would be a great pleasure to arrange for you the rental vehicle at the best price! During your stay at our Hotel you can ask us and book one of the many types of Tours You can make on the island of Santorini. The island of Thirassia and sunset tours to Oia village. The island of Santorini is a magical place in Greece where you can have unique holidays with your Companion, Friends or with your Family. Besides the special accommodation that our Hotel can offer in Akrotiri, we can create the best program for your holidays on the island, offering Unique Excursions-Tours and many Info & Tips to make the most of your time on the island of Santorini. Panoramic views of the Sea and the famous Caldera of Santorini from your balcony, this air-conditioned room comes with a TV and a fridge & free WiFi. 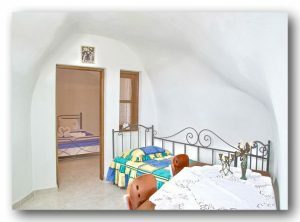 All rooms are nicely decorated with traditional furniture and kitchenette. This twin/double room has a beautiful balcony with Caldera view and many other facilities like Shower,TV, Air conditioning,Hairdryer, small cooking area, Refrigerator and much more for Your best Summer vacations in Santorini. This Superior Twin Room with 2 single beds has balcony with Caldera view and many other facilities like Shower,TV, Air conditioning,Hairdryer, Kitchenette, Refrigerator and much more for Your best Accomodation in Santorini island in Greece.